Shopping for a jersey can prove a frustrating and time-consuming exercise if you don’t know exactly what to look for. Here are some considerations that will help you make a decision. Comfort: There are several aspects of a womens cycling jersey that contribute to your comfort, or discomfort. First there is the fabric. You need to look for a jersey made from a material with moisture wicking properties. This means that it will whisk away and evaporate your sweat as you ride so that it doesn’t make you cold or uncomfortable. Anti-microbial properties are also desirable as they ensure that your jersey does not develop a nasty odor. Biking level: If you’re a pro rider, there is a jersey designed to compliment your riding style. It will be made to be a close fit so that excess fabric doesn’t create resistance by flapping in the wind. The back of pro riders’ jerseys are deliberately made longer than the front so that they fully cover the back even when you’re bent over in the aero position. If you’re only biking for leisure, then you should go for the casual fit jersey. This design is not skin-tight and is made for riding in an upright position. It will also not have the elastic band that keeps wind from getting in beneath the jersey. 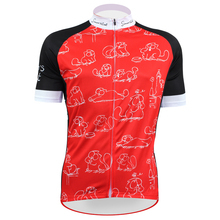 Jersey design: When you start shopping you will discover there are several different designs of womens cycling jerseys available. You can have a sleeveless, short-sleeved or long-sleeved jersey. The zipper design of jerseys differ and you can have a jersey with a full zip or one with a quarter zip. If you’re style-conscious you can try the jerseys with a hidden zip. If you can’t find a jersey on e-stores like AliExpress.com, eBay or JensonUSA.com that tickles your fancy needs, you can always order for a custom womens cycling jersey made to your exact specifications. There are online shops where you can give your size specifications, choose from different fabrics and even create the design you want from scratch. 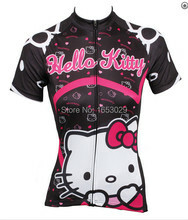 Where to Buy a Womens Cycling Jersey?